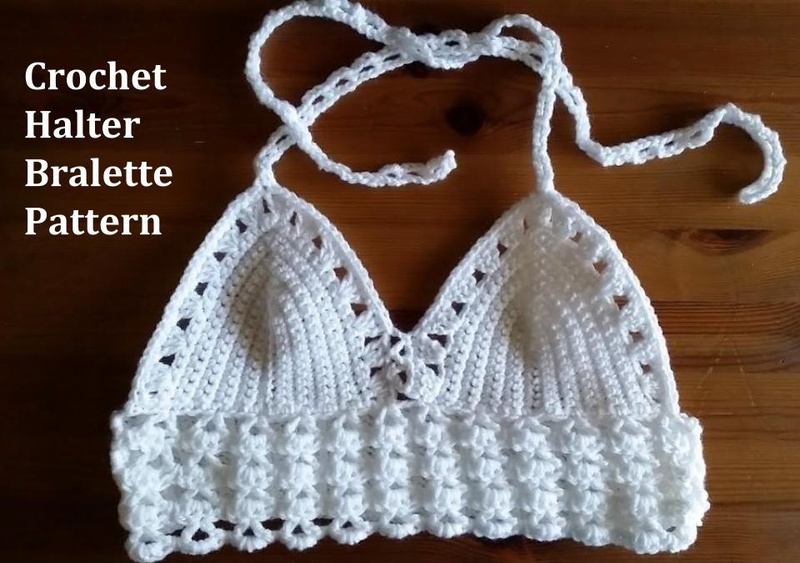 I don't know why, but I never really crochet in the summer. Maybe it's because I associate crochet with cold weather, hot chocolate, and cuddling up in bed with a good TV show. Or maybe it was the one time I made a blanket for my dad on Father's day: the larger the blanket got, the heavier it got in my lap, and the hotter it got. The worst! 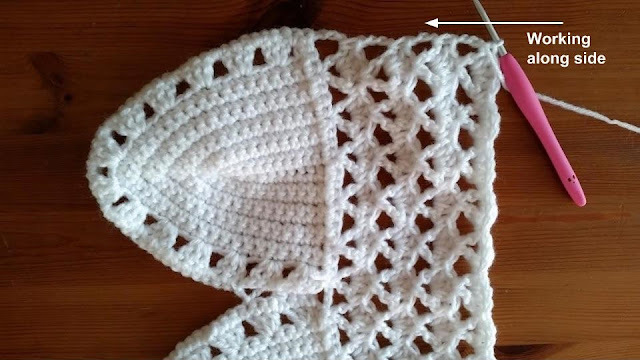 Most of my crochet projects are cold weather accessories, so I got to thinking, maybe I should branch out and get more creative with it. 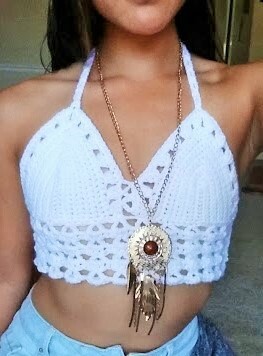 Crochet clothing is so in right now. Every time I'm in a store and I see something crochet, I think, "Hey, I can make that! ", but never really get around to it. I still have WIPs from last year in my blog queue that I still haven't finished yet. Oops. 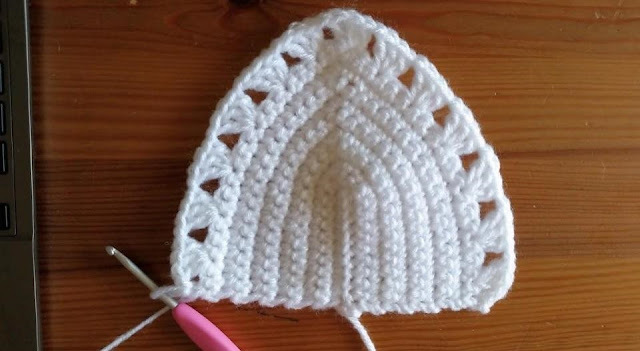 Anyone else guilty of starting multiple projects before finishing the last one? 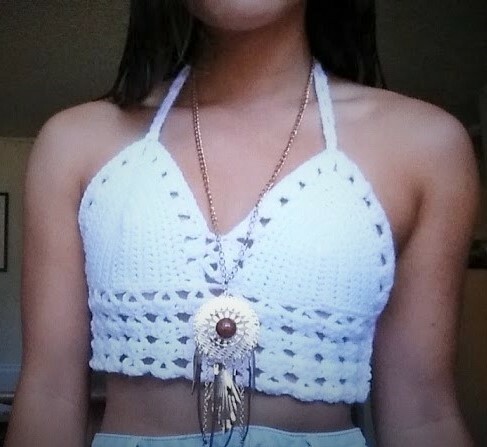 My friend's suggestion to make a bralette was the final push I needed to start channeling my inspirations to a project. This was a lot easier than I thought it would be, and you can do so many variations with it. 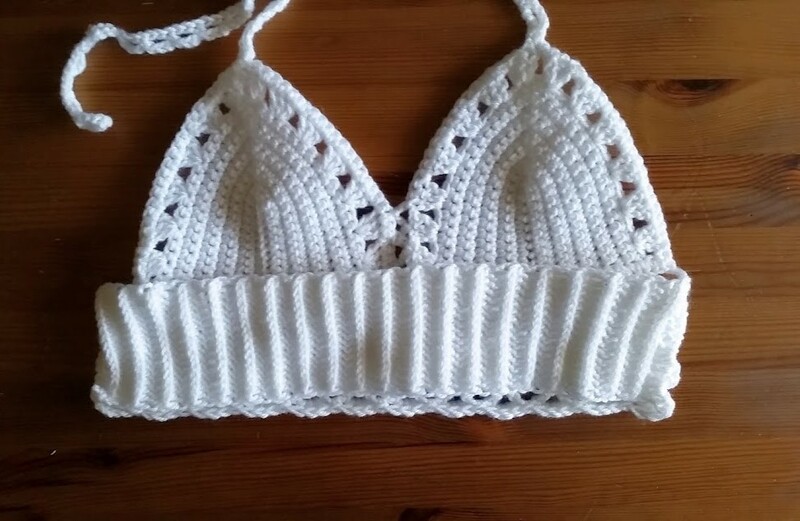 Future bralette ideas: tassels on the bottom, small grannies, lacy bottom, multiple colors. Ready for next summer's music festivals! 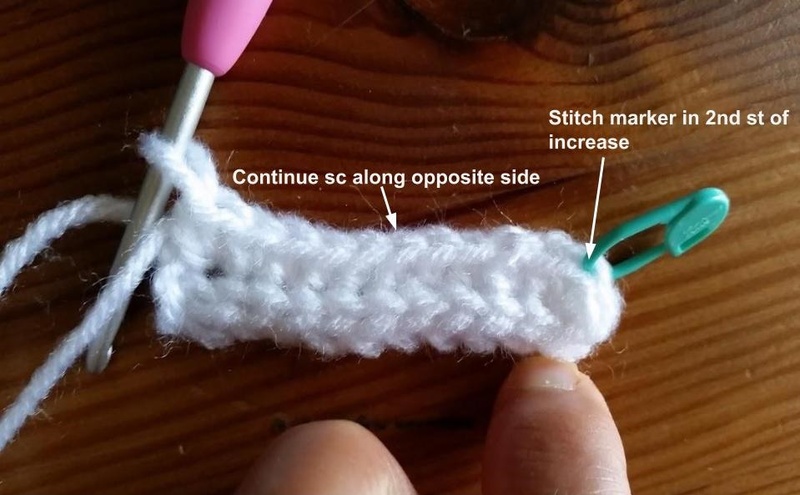 I will refer to 3 sc in 1 stitch as an increase. Make 10 fsc. Or ch 11 and sc in second ch from hook and across. Make 3 sc in first st. Place st marker in the 2nd sc of the increase. Do not turn. Sc along the 9 sts on the opposite side of the piece. Ch 1 and turn. Sc across until you reach the st marker. Remove st marker and make 3 sc in that st. Move st marker to the 2nd sc of the increase. Do not turn. Continue sc across sts on the opposite side. 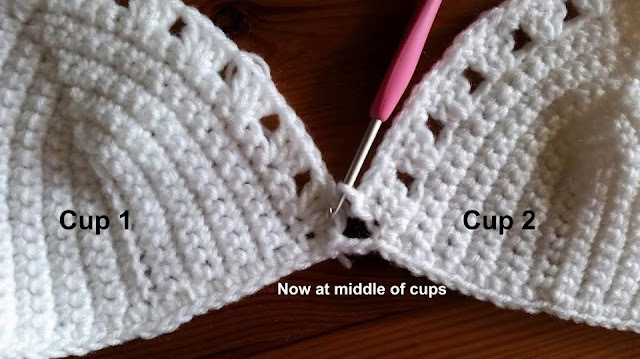 Repeat Row 2 until the cup is the desired size. 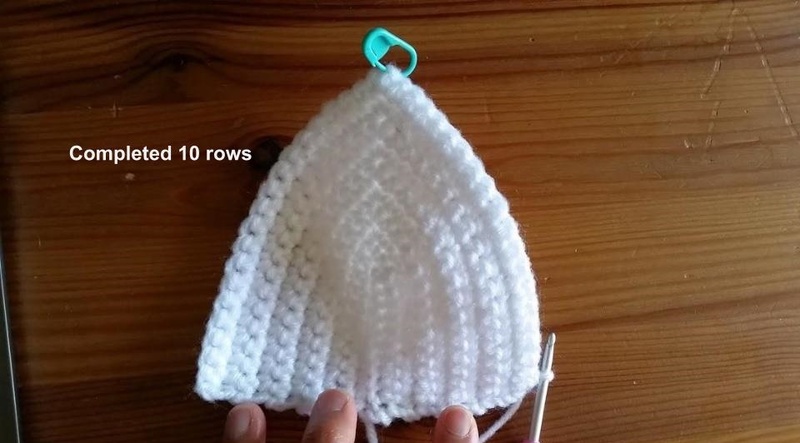 I made mine until I had 10 rows. Ch 1 and turn. Sc in first st. 3 dc in next st. *Ch 1. Skip 2 st. 3 dc in next st.* Repeat from * to * until you get to the bottom edge. End on a sc in the last st. 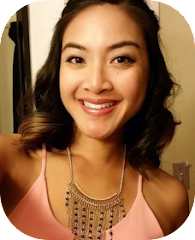 It's okay if you don't have an even amount of sts to skip at the end. Fasten off. Make a second cup, but do not fasten off. With yarn still attached to cup (referred to as Cup 1 now), turn and sc evenly along the bottom of the cup. 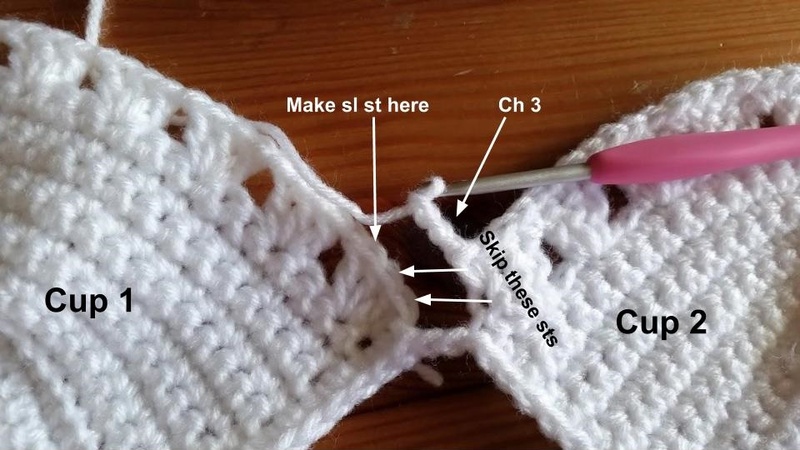 Ch 1 and insert hook into the corner of the other cup (Cup 2) and join with a sl st. Sc same amount along the bottom of the cup. 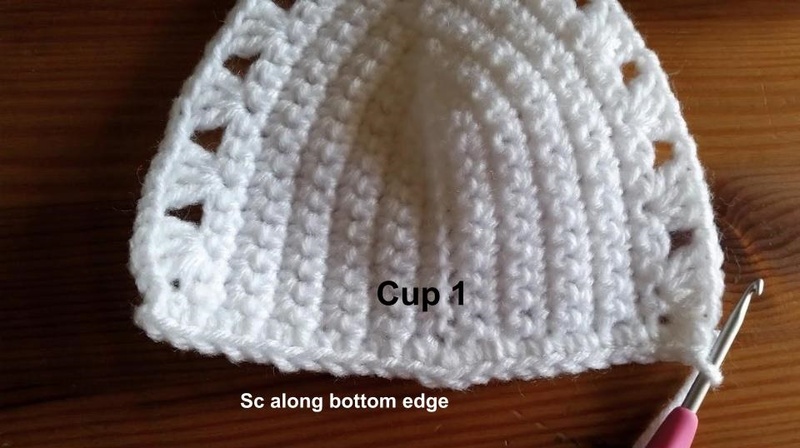 Working along the side of the cup, sc in each dc and ch 1 space until you get to the middle of both cups. Ch 3. Skip 2 st on Cup 1 and sl st in the next st on Cup 1. Ch 3. Skip 2 st on Cup 2 and sl st in the next st on Cup 2 (count the ch 1 space as a st). The idea is to create a zig-zag effect. Repeat 2 more times. On Cup 2, complete sc in each dc and ch 1 space until you get to the bottom edge. The bottom edge will now be worked in rows. Turn at the end of each row. Ch 4 (counts as dc and ch 1) Skip 3 sts. [Dc, ch 3, dc] all in next st. *Ch 1. Skip 3 sts. [Dc, ch 3 dc] all in next st.* Repeat from * to * until you get to the other side of the cup. Ch 3 (counts as dc). 2 dc in ch 3 space of previous row. Sc in ch 1 space. *3 dc in ch 3 space of previous row. Sc in ch 1 space. * Repeat from * to * across, ending in sc in last ch space. Repeat Rows 1 and 2 until it is the desired length, ending on Row 2. Do not fasten off. Turn piece on its side. We will now be working the back band in rows. Ch 1 and hdc evenly along edge. Make 3 hdc in the ch 3 spaces. Stop when you get to the bottom edge of the cup. Ch 2 and turn. Hdc in each single loop below the hdc for a knit ribbing effect (see tutorial for this in the Boot Cuffs pattern). Ch 1 and turn. 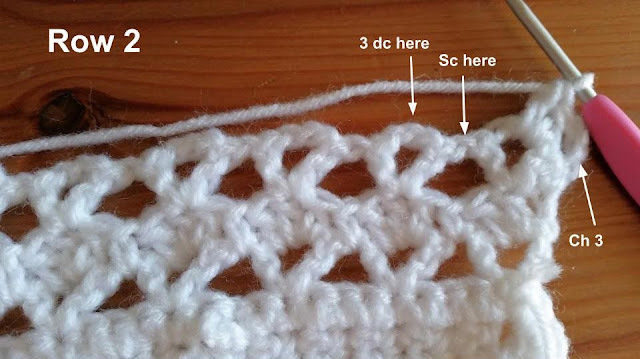 Repeat Row 2 until the band is the desired circumference. When complete, join to the other end of piece with sl st across. Make 3 sl sts in the ch 3 space. Fasten off. Attach yarn to the top of one cup with a sl st. Ch 80. Turn. Sc in second st from hook. *Ch 3. Skip 2 st. Sc in next st.* Repeat from * to * across. End with a sl st in the same join sl st.
Fasten off. 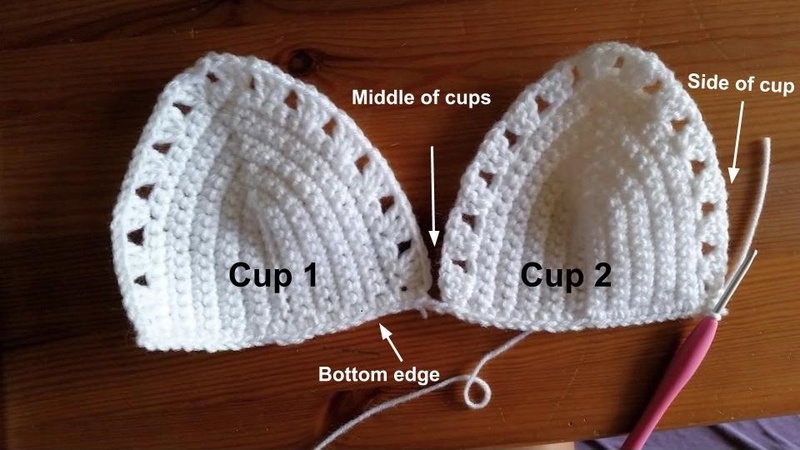 Repeat on the other cup to complete the halter straps. Weave in all ends with tapestry needle. It looks cute with a cardigan over it too! Love this! It's perfect! Thank you! Thanks so much for the free pattern! You did a great job of designing it and giving instructions. This was fun to make for my granddaughter, she loves it. This is very pretty! What size cup would you say this makes? The pattern makes an A-B cup. You would just add more rows of Row 2. Hope that helps! I haven't tried this, but I would suggest fastening off before the Back section and attach the yarn in the middle where you turn it on its side. Work in rows, and eventually decrease until you get to the width you want the tie to be. Repeat on the other side. You may have to play around with it a bit to make sure it's even on both sides. Also (sorry for the flurry of messages!) 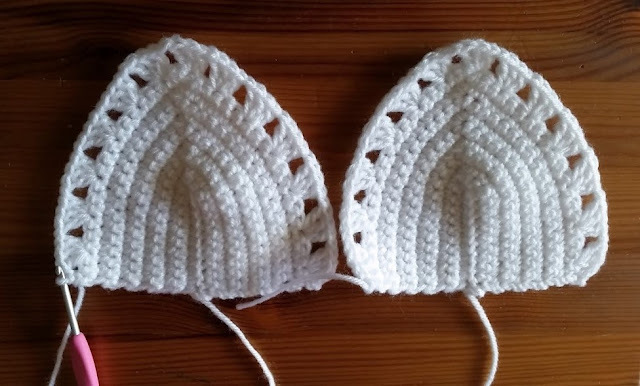 I've ordered a crochet hook set which contains both a 3.5mm and a 4mm, but not a 3.75 :( would you say I could use either of these instead? Maybe the 3.5mm?